Medium shrub or small tree 10-20' with fine foliage and profuse white flowers appearing in spring/summer. Tolerant of most well-drained soils and situations, including waterlogging and moderate frosts. Plants respond to pruning and can be grown as a hedge or screen. 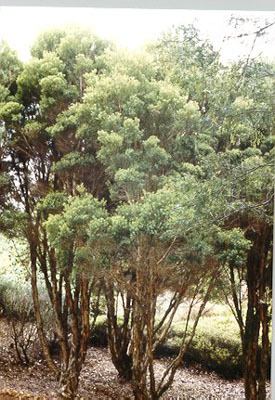 This species is grown for tea-tree oil extraction.